If you have any problem in our camping cookware set, please feel free to contact us! 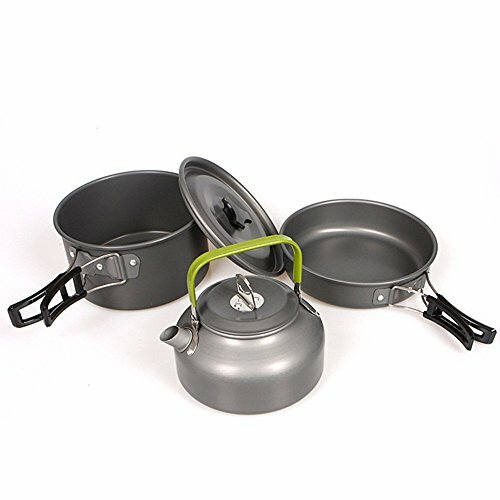 【HIGH QUALITY】- FDA APPROVED Non-Toxic Anodized Aluminum Camping Cooking set, is solid, light and durable. And very EASY to clean. 【HIGHLY COST-EFFECTIVE( Suitable for 2-3 people)】- 1 x Big Pot (D*H: 16.6*8.9cm), 1 x Non-stick Frying Pan (D*H: 16.7*3.9cm), 1 x Tea/Coffee Pot (Capacity: 0.8L), 1 x Mesh Bag. 【EASY TO CARRY】- It is folding and small which makes all the objects stored together in a mesh bag, very space-saving. 【PERFECT GIFT for YOURSELF/ FAMILY and FRIENDS】- Camping Cookware kit for anyone looking for a high quality and great value product for the outdoor camping/ picnic or bug out bag to enjoy at the cookout with the people you love. 【100% AFTER-SALE GUARANTEE】- Once you buy this camping cookware kit from us, you will own a 100% Satisfaction Guarantee. If you are not satisfied with our item or you receive a defective one, please feel free to contact us by Oceanheartus@outlook.com. If you have any questions about this product by Oceanheart, contact us by completing and submitting the form below. If you are looking for a specif part number, please include it with your message.